My wife’s boss (a biologist) got a book in her inbox a couple of days ago put out by the North Dakota Bible Society – the grandiosely titled Evolution Cruncher. Apparently someone mailed these to all the biology faculty at the university of Maryland. I had a brief look through last night. I’ve been exposed to creationist literature before, so I sort of knew what to expect. I was nonetheless surprised by how blatantly dishonest this book is. I guess it’s been a while since I read anything by young earth creationists, so my memory had faded somewhat. Take a look at the site. It’s scary that these guys are a significant political constituency in some parts of the country. I should clarify that I’m not hostile to all creationists – there are sincere and honest people who are creationists. I am, however, extremely hostile to blatant manipulative liars, which the North Dakota Bible Society apparently are. High amplitude waves in shear thickening liquids have very cool effects. Watch the video. Now here’s a poor guy who couldn’t catch a break. First, he’s gelded in a circumcision accident, then he’s raised as a girl at the instigation of a psychologist who believes that gender is a social construct, then after rebelling against this forced gender swap at the age of fifteen, he has to undergo reconstructive surgery and remove the breasts that grew as a result of the hormone treatments, and last week, as a result of a financial fraud that impoverished him, he committed suicide. As the article says, he made a valuable contribution to science, providing major evidence against the Blank Slate hypothesis, and showing the folks who think that gender is infinitely malleable to be terminally deluded. Thanks to him, perhaps no other little boys will have to go through what he went through. The locust infestation we’re about to have is low fat, zero carbs, and high in protein. Get ready to put on the feed bag and dig in. Yoda has died. May he be the first of many four-year olds, and lead the way to two-hundred year old people. I’ve always been fascinated by how quickly the flora can change in just a short distance. 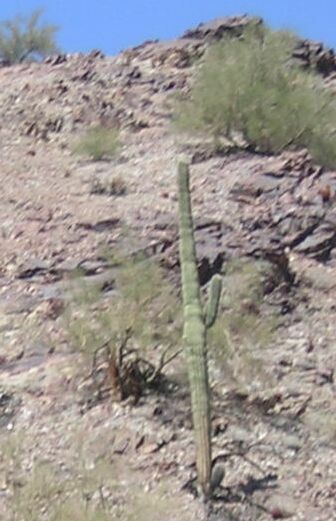 Driving to Phoenix from LA on Thursday, I shot this picture of a saguaro–the first one I saw on the trip (forgive the quality–I shot it from a moving car, and cropped it from a much larger photo). It was just a few miles east of the California/Arizona border (and accordingly just a few miles east of the Colorado River). I’ve never seen a saguaro in California–they seem to know where the state border is, at least at this latitude. This is the transition region from the desolate Colorado Desert (the low desert south of the Mojave that encompasses much of non-coastal non-mountainous southern California) and the beautiful and cactus-filled Sonoran Desert, of which the saguaro cactus is emblematic. It doesn’t seem to be the river itself that demarks it–you don’t see the cactus until you start to climb up into the hills just east of it, out of Blythe. Apparently it’s a combination of longitude and altitude, though as you get farther east and south, toward Tucson where the national monuments are, the suitable altitude can vary considerably. I’m still going to post on the conference itself, but this is the only picture that came out well, other than one of Jim Muncy. I didn’t have enough light from the distance I was at with my little two megapixel Nikon. I don’t know whether or not Heather does, but apparently Mickey has two mommies. Some lizards and many other animals reproduce with only maternal genes, but mammals do not. Lab experiments in mice had produced embryos and fetuses, but no successful births. Actually, for reasons stated in the article, this doesn’t mean that human parthenogenesis is just around the corner, but I suspect that it is inevitable. At some point, we’re going to have to work out the sociological implications. Here’s some research that confirms my own empirical experience–that people become more (or less) physically attractive to you the better you get to know them, depending on other aspects. I’ve noticed that women to whom I woudn’t necessarily have given a second glance upon first exposure become quite physically appealing over time and repeated exposure, if they have other desirable characteristics–they “grow on you,” as the old expression goes (for me, intelligence is a key enhancer). This is probably a useful evolutionary trait, assuming that monogamy is a useful evolutionary trait. Well, not completely. They still don’t know why Saint-Exupery’s plane went down, but now they know where. Which reminds me. I thought that there had been an expedition launched a couple years ago to go look for Amelia Earhart’s Electra, after seeing what may have been wreckage offshore from a satellite image. Does anyone know the status? Now this is fun engineering.